The brainchild of Mr. Mandeep Singh, All4Pets is as the name suggests - “all for pets” The innovative division of the parent company Ek – Tek – Pharma, All4Pets has made a niche for itself and is one of the most well known brands in the pet industry. With a motto to develop products that are suitable for pets and help meet the requirements of the pet parents, All4Pets was launched in the year 2009 with an aim to provide premium quality products to pet owners and have developed product offerings which have been scientifically designed and approved by pet experts. At present, All4 Pets has a repertoire that includes products under all various heads. Not only can you select pet grooming products such as combs, brushes, molting and pin brushes of different sizes and shapes, you can also choose palatable and nutritious dog chew treats that will help maintain the dental health of your dog. All4Pets also has different types of shampoos that you can choose from – there are shampoos to combat tick and flea infestation while there are also shampoos that are suitable for dogs and cats with normal to sensitive skins. Other range of products by All4Pets includes health supplements, dental care products, tick and flea solutions and body wipes. Recently All4Pets also launched its range of canned food for dogs. Ø Meaty treats : All4Pets offers yummy meaty treats for dogs such as Dog Training Treats Chicken Flavor, Dog Treat Buddy Dual Stick with Potato & Milk, Dog Treat Twisty Stick, Dog Treat Tri Roll, and Dog Treat Dual Bone. Ø Dog Dental Treats : Dental treats will make sure your dog’s teeth are healthy and he does not chew your slippers and shoes! Products from All4Pets are Dog Treat Dental Brush Milk Flavor, Dog Treat Magic Bone, Dog Dental Chew Bone Milk Flavor, Dog Chew Dentopet, Dog Dental Rope Milk Flavor, and so on. Ø Dog Biscuits : Dogs love biscuits! Buy them Dog Treat Buddy Biscuits from All4Pets. These biscuits are available in orange, carrot, and blueberry flavors. Ø Supplements: The supplements for dogs offered by All4Pets are Pet-O-Live Dog Growth Supplement, Pet-O-Live Pet Liver Tonic, Digipet Digestive Dog Syrup, Pet-O-Boost Dog Energy Supplement, Pet-O-Cal Dog and Cat Calcium Tablets, Dog Joint Active Chicken Flavored Tablets, and Imun-O-Pet Dog Immunity Supplement to name just a few. Ø Veg treats: If you want to provide only vegetarian food to your dog, you can choose Dog Training Treats Milk Flavor, and Dog Treat Magic Bone from this company. Ø Collars: The Dog Choke Collar Leather is the best example of collars offered by All4Pets. Ø Leashes: All4Pets offers a variety of leashes for you to choose from including Dog Leash & Collar Leather, Dog Chain Stainless Steel, Dog Leash with Spring Leather, Pet Chain with Leather Leash, etc. Ø Ball Toys: All4Pets mainly offers ball toys for dogs to entertain them and to keep them hooked for long hours. The products from this company include Dog Ring Ball and Pet Rubber Ball. Both are offered in various sizes to choose from. Ø Utility: The Leather Handle Hook from this company is extremely famous among buyers because of its durability. Ø Muzzles: Dog Muzzle Leather from All4Pets is available in various sizes. It is durable and comfortable so that your dog is not in pain or discomfort when he wears it. All4Pets offers various powders, soaps, and shampoos against ticks such as Tikfite Anti Tick-Lice Dog and Cat Powder, K9 Bact Dog Powder with Deodorant, Tikfite Anti Tick Dog Shampoo, and Scabovate Anti Tick-Flea Dog Soap. All4Pets offers numerous non-tip bowls for dogs, which include Pet Bowl Stainless Steel and Pet Bowl Bamboo. They are durable and safe. Ø Bath Accessories: You can buy the Pet Towel from All4Pets, which is soft and snuggly. 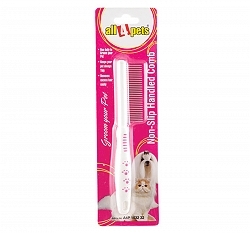 Ø Brushes and Combs: The company offers a wide range of brushes and combs for dogs. Products include Dog Rake Comb, Dog Brush Slicker, Dog Comb Moulting, Dog Brush Handled Wooden, Dog Brush Dual Soft, Pet Grooming Brush, and so on. Ø Deodorizers: Pet Perfume, the brand offers, in numerous fragrances such as flowers, cherry, and aloe. Ø Grooming tools: The company essentially offers Dog Nail Clipper for dogs. Advanced grooming tools include Pet Grooming Table with Adjustable Height and Pet Grooming Table with Electrical Remote. Ø Shampoos and conditioners: All4Pets offers many different shampoos and conditioners for dogs such as Aloevera Moisturizing Pet Shampoo, Dog Shampoo Magic Fur, Tea Tree Oil Anti-Dandruff Pet Shampoo, Tender Coat Tearless Pet Shampoo, Dark-coat Pet Shampoo-Conditioner, and so on. Ø Shedding Control: To ensure that your dog does not shed too much, you can choose products such as Dog Matt Breaker from All4Pets. Ø Dental Care: Take good care of your dog’s teeth with dental products such as Dentopet Dog Tooth Paste, Dentopet Foam Tooth Gel for Dogs, and Dentopet Mouth Freshener Spray for Dogs. The company also provides training aids such as Chew-X Spray For Dogs and Cats to make training your pet easier for you. 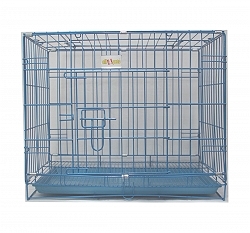 The various products offered include Dog Cage, Foldable Square Chrome Dog Cage, Pet Cage with Wheels, Fiber Flight Dog Crate, Assembled Pet Tent House, and Fiber Pet Hut. The brand has strived to keep customers happy through its quality products. All the products are ethical and innovative, designed to provide pets with the best.